Valeska Soares, retrospective Valeska Soares: Entrementes, curated by Júlia Rebouças, at the Pinacoteca do Estado de São Paulo, Brazil. 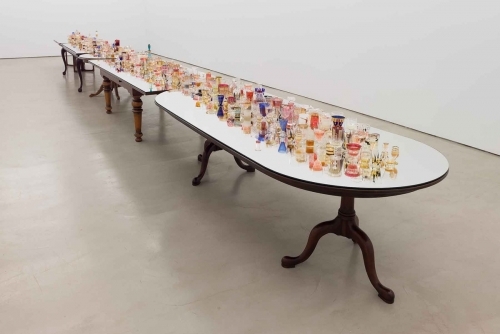 The Pinacoteca de São Paulo, a museum of the São Paulo State Secretariat for Culture, presents the exhibition Valeska Soares: Entrementes [In the Meantime] from August 4 to October 22, 2018. Curated by Júlia Rebouças, the exhibition occupies the fourth floor and the entrance space of Pina Estação and presents a selection of Valeska Soares’ work from the last 30 years, in which the main themes center on the subject and the body, memory and affects, and the relationship between space, time and language. Born in Belo Horizonte, in the state of Minas Gerais, in 1957 and based in New York since the early 1990s, Soares is one of an international group of artists who have expanded the possibilities of installation in art by subjectively engaging the viewer, with sculpture as her primary medium. Her works often call upon fictional narratives in literature to weave experiences of intimacy and desire that reach beyond the individual sphere and elicit a collective sensibility. With her use of evocative materials, the artist explores the tension created by oppositions. Her sculptures and installations often feature reflective materials such as stainless steel and mirrors, in contrast with organic and sensory materials such as flowers, in order to enhance the visitor’s experience. It is to this effect that Soares makes use of a variety of sensory techniques, including sound, to create atmospheres and experiences that are at once inviting and disturbing. For the exhibition at the Pinacoteca, Júlia Rebouças has selected works from the museum’s own collection and from private collections, as well as works lent by the artist herself, some of which have never been seen in Brazil. As the title of the exhibition suggests, the paintings, collages, objects, installations and sculptures displayed present intermediary contact zones: the intersections between the individual and society, between the covert or mysterious and the explicit, between the past and future, etc. “The exhibition also includes works that explores the idea of collectivity, whether through the act of collection, which Soares explores in a number of her works, or by constructing a shared experience, as in Epílogo (2016) or Vagalume (2007)”. Valeska Soares: Entrementes deals, in general, with all that which concerns the intimate but can be lived in communion. “In this sense, Detour (2002) – inspired by the tale Cities and Desire by the Italian writer Ítalo Calvino – is a central work, since it originates from the idea of the same dream that is dreamed and narrated by different people,” explains Rebouças. In the story, the dreamers, hoping to find the object of their desire – a woman running naked – end up creating a city that replicates the paths where they lost her. Soares uses the tale as her inspiration to create an environment that, although confined, suggests an infinite number of exits through the use of mirrorings. The artist also incorporates architectural qualities into her practice, a result of her training as an architect. From this perspective she embraces the idea of a vanishing point as the central axis and construes the space not only as a physical and illusory entity, but as a place that allows visitors to perceive themselves in relation to it. “The artist does not separate her work from the public. The works openly present themselves, they leave clues to how they were created, which are evident in their material construction, opening up to the game of sentient engagement and participation,” says Rebouças. “Part of the strength of her poetics lies in that which evaporates, flows, fades, wilts, silences, dissolves, melts, breaks,” the curator adds. The 1998 installation Untitled (From Vanishing Points), from the Pinacoteca’s collection, is an example of this. In this work the artist reproduces a set of potted plants as they were arranged in her garden. Replicated in wax, porcelain and aluminum, they mark the absence of life as an organic force, while they are signs of another time or existence that escapes the attempt to restrain it. In this way they replicate the structure of memory, since it is only possible to look back and remember from the present, and it is from the experience of the now that one fills the gaps of the past. The exhibition by Valeska Soares is part of the retrospective series of exhibitions being housed on the 4th floor of Pina Estação dedicated to artists who started their careers in the 1980s.